Spirulina is a microscopic blue-green algae, living both in sea and fresh water. It is a whole-food, not a concentrate or extract. It is valued for detoxifying, as well as for its nutrient profile: high in vitamins, minerals, chlorophyll, antioxidants, and enzymes. 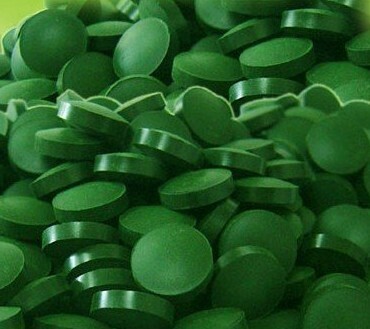 Spirulina is a high-energy food. It contains all the B vitamins (which are themselves synonomous with high energy). It is alkalizing and can help keep the body from becoming overly acidic. 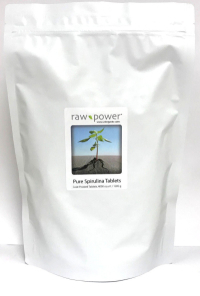 Take tablets with water, smoothies, or juices, and enjoy all the nutritional benefits spirulina has to offer. Each tablet is 250mg. 4000 tablets per bag = 1000 grams. - Cleanest spirulina available anywhere. This is a low-temperature, cold-processed, 100% RAW, organic product. Contains NO fillers, NO additives, NO preservatives, NO binders and NO coatings.